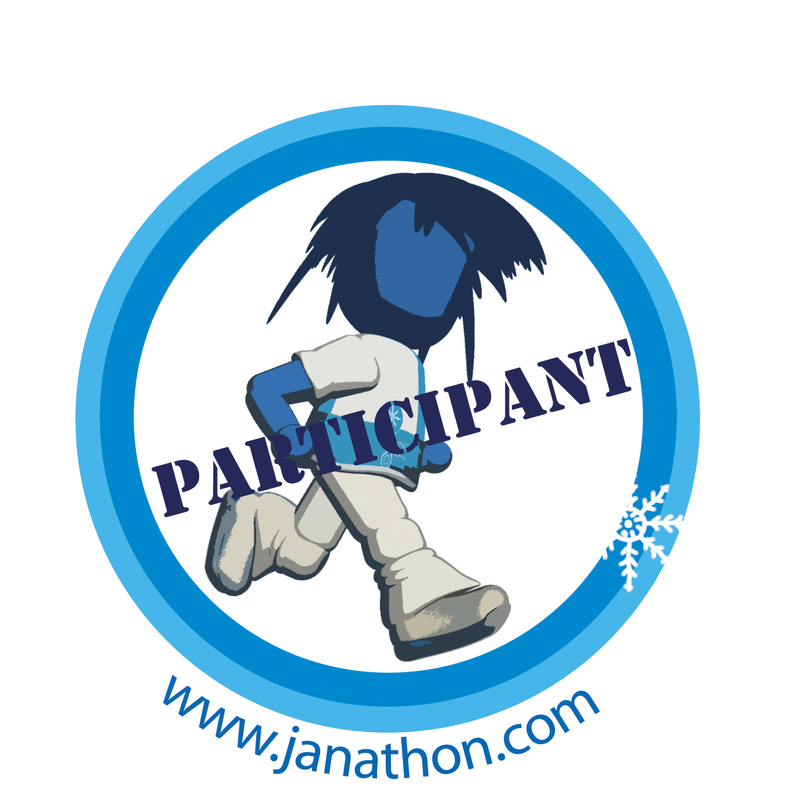 On the first day of ‘proper’ duathlon training, I ignored my 7am alarm and went back to sleep for an hour. Well, I didn’t want to cycle in the rush hour, did I? And I especially didn’t want to cycle when school run mums were about, oh no. As I was doing proper training, the pink bike (Lady of the Manor poncey thing with a basket) was ditched in favour of the purple one (£35 battered mountain bike with road tyres from some bloke on Gumtree) with jeans and t-shirt being swapped for running kit. I even put my hat on. I was a bit perturbed by the schedule calling for minutes, not miles, as I haven’t a clue about 45 minute loops for cycling but Shaun said ‘do an out and back’. I said, ‘I hate out and backs’ but he said, ‘it’s training, you’re not supposed to enjoy it’ and I had to concede he kind of had a point, in a no pain, no gain kind of way. So, I was all ready to go. 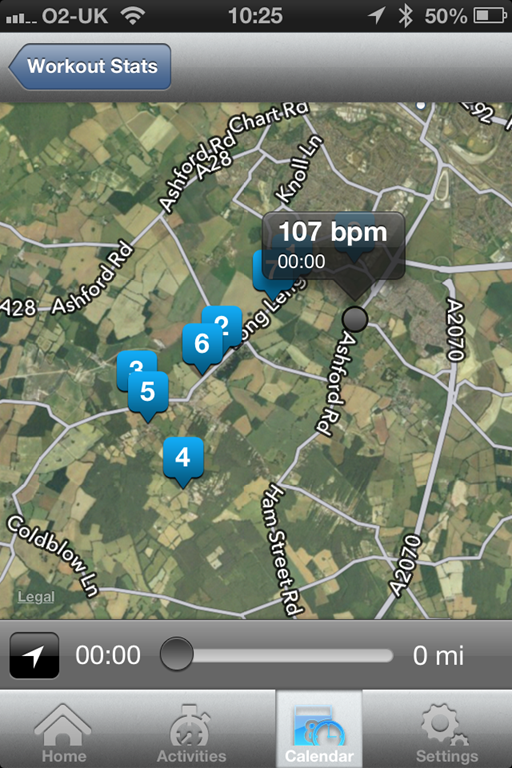 I also had a new gadget to try out – the Scosche Rhythm Armband Heart Rate Monitor. I’d tried the previous model of this – the Scosche Wireless Pulse Monitor – which I reviewed, not particularly favourably, here. I’m pleased to say it’s improved (despite being pink because it’s ‘for women’. Bleurgh), but more about the improvements later. Because it’s a heart rate monitor, you’re supposed to – duh – monitor your heart rate with it. But, I was going to be on my bike and how was I supposed to see the screen when the phone was going to be on my arm? I needed an iPhone mount for my bike and didn’t have one. I didn’t even know if such a thing had been invented. Of course it had – there were thousands on amazon when I came home and had a look; I bought this bike phone holder for £3.99. Yay. Still, finding out something had been invented an hour after needing it didn’t really help at the time, so I set the Scosche Rhythm app up by telling it I was going cycling for 45 minutes and wanted the GPS on, stuck my phone in my armband and hoped no one saw me while I was out as, on the other arm, I had my Garmin on my wrist, along with the Scosche Rhythm armband and I looked – to be blunt – flipping ridiculous. But I had a new gadget to play with and gadgetry comes before vanity, yeah? Well, no, but ho hum. 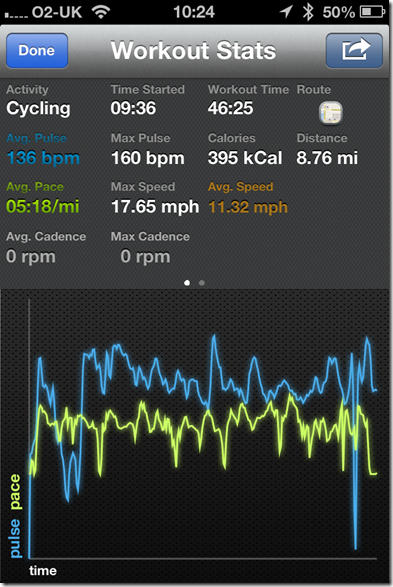 I got my bike out of the garage, started my Garmin, started the Scosche Rhthym and I was off. But because I was doing proper training today, I made an extra effort and you know all those times in the past I’ve said ‘cycling’s just sitting down’? I take it back. Cycling takes effort; who’d have thought it? 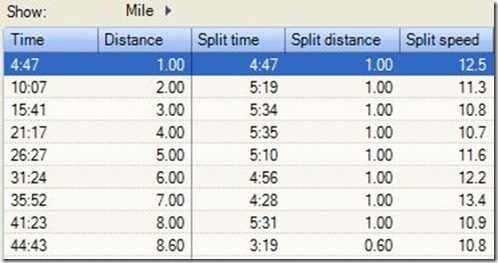 Mind you, despite all that extra effort I made (including mental effort by not braking going downhill, eek), I still only averaged 11.5mph but, in my defence, it was windy out there this morning. 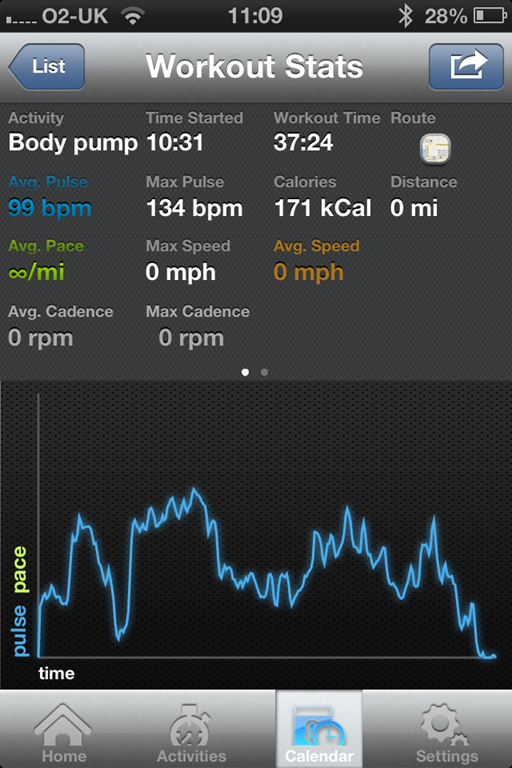 When you finish your workout, the Scosche Rhythm app shows you a screen with all the stats. 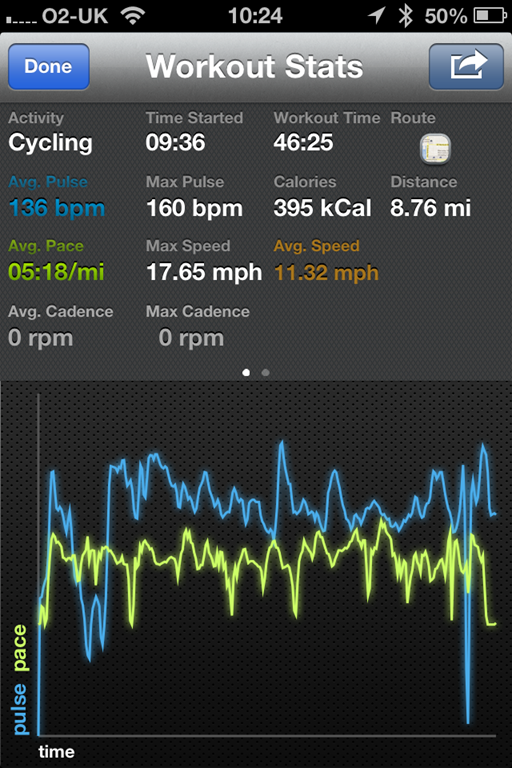 The speed and calorie burn wasn’t too dissimilar from the readings on the Garmin and, unlike the previous model (which used the myTrek app), this one tracks you on a map. 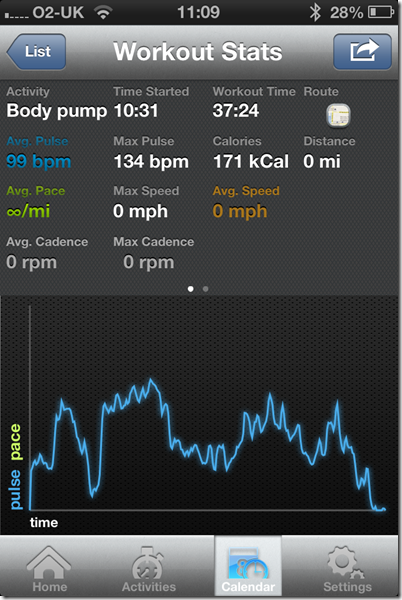 I also used it while I did body pump after the bike ride. 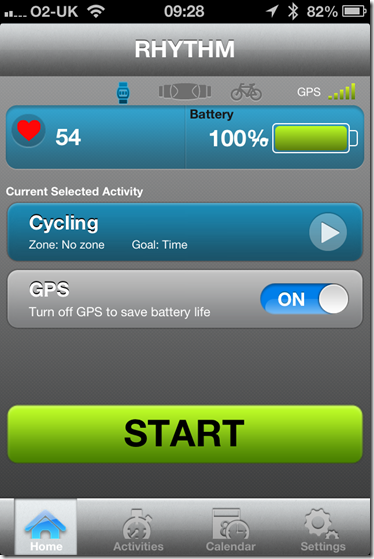 You can set up the app to suit your own workout – set your goals for heart rate or time, performance or weight loss and, after your workout, it will automatically upload everything to the Scosche dashboard where you can also upload your stats to various websites, including www.myfitnesspal.com (which I found really handy). 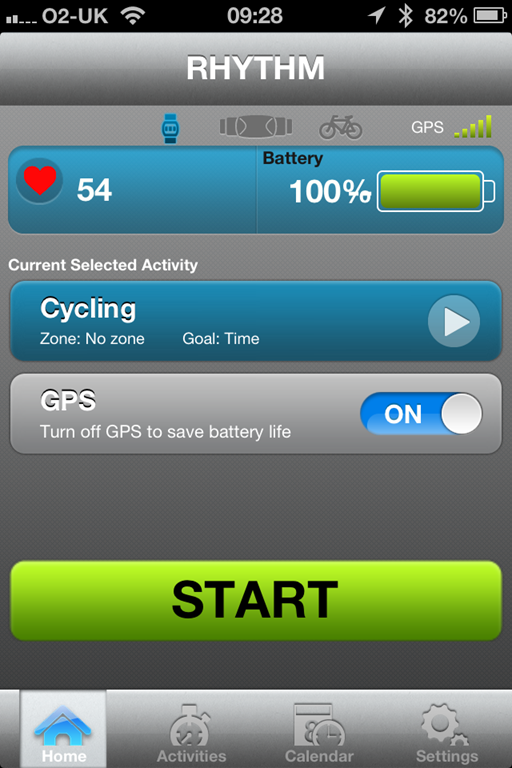 If you want to play music while you’re working out, you can control the music player from the armband. 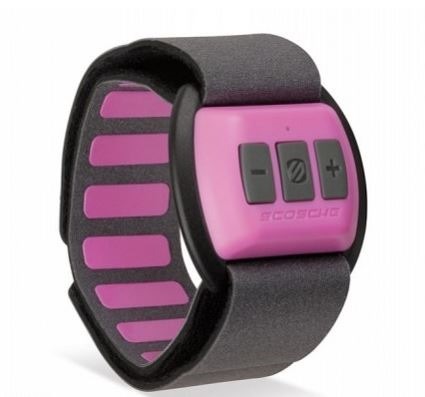 The Scosche Rhythm Armband Heart Rate Monitor is a vast improvement on the Scosche Wireless Pulse Monitor and I’ll be using it again (especially when I get my bike mount). It costs $99.99 and more information is available at the Scosche website.